There is much controversy over whether human carbon dioxide emissions cause global warming. Warming has come in fits and starts, and the warmest summer in years in 2012, has been followed by one of the coolest this year. Global warming predictions are based on computer models, and are not readily falsifiable (a hallmark of all other scientific inquiry). Also, both scientists and governments stand to gain power and money (through research dollars and carbon taxes) should the belief in global warming become more widespread. The French philosopher Voltaire once said "If God did not exist, it would be necessary to invent him". Perhaps, for those in power, the same is true of global warming. Thus, anthrogenic (man caused) global warming is controversial. What is not controversial is this. Carbon dioxide concentration in the atmosphere is increasing. We have objectively chronicled this rise over the past decades. We know this is from human activity, releasing millenia of stored carbon in coal, oil, and natural gas into the atmosphere. 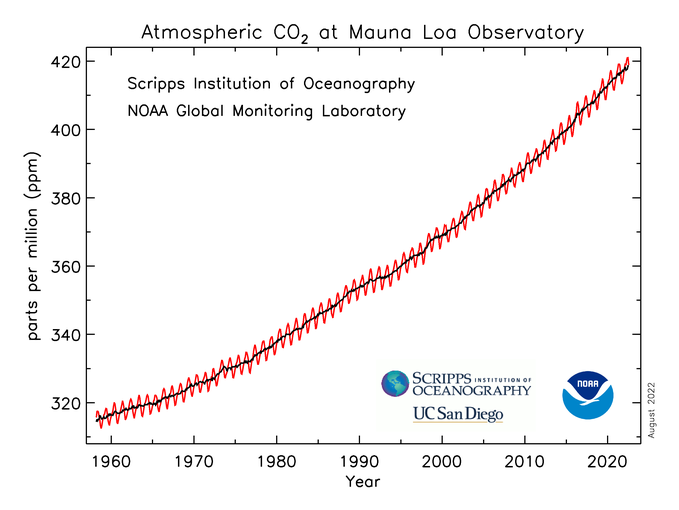 Below you can see the slow but steady increase carbon dioxide levels as measured at Mauna Loa Observatory in Hawaii. So, carbon dioxide increase is easily and objectively measured and uncontroversial. Why does this matter if global warming is unproven? Because rising carbon dioxide has other negative effects. First, rising carbon dioxide can raise the acidity of the oceans. We are observing this happening right now. When carbon dioxide comes in to contact with water, it frequently forms a chemical reaction by which a hydrogen ion (or proton) is released. The equation is shown below. This loose hydrogen ion is actually what makes things acidic. The scientific abbreviation pH even stands for "power of hydrogen". The exact same process happens in the body, which is why you will see people with certain conditions (like diabetic ketoacidosis) breathing very fast in order to decrease acidity of blood. For most of recent history, the oceans have been slightly basic. However, with increasing carbon dioxide in the atmosphere, the above chemical reaction is happening more and more, and the ocean is becoming more acidic. It is believed that the ocean absorbs 30-40% of all carbon dioxide, and that the acidity of the oceans has increased 30% as well. This can have negative consequences for the many ocean creatures that pull other chemicals out of water. This ocean acidification also is slowing the growth of other organisms that pull calcium out of the water, like coral. If these grow more slowly, the entire ocean food chain may be adversely affected, meaning fewer fish and fewer marine mammals. The economic cost alone, not to mention the ecologic cost, would be very large should this process continue unabated. For those who have the inclination, there is an excellent PBS documentary on ocean acidification here. Most of the proposed solutions to increasing atmospheric carbon aren't solutions at all, but draconian restrictions on affordable energy and unrealistic targets for emission reduction. Such policies are so bad economically that Europe, previously a leader in decreasing carbon emissions, has reversed itself and now loosened its emission guidelines. The same is happening in Japan. Clearly, decreasing emissions is not a viable solution currently. If you look at the graph at the top of this post (carbon in the atmosphere), you will see that it actually is saw toothed in shape. This is due to seasonal variation, or the decrease in carbon dioxide in the air during summer because of uptake from plants undergoing photosynthesis. Plants pull carbon from the air, use it during photosynthesis, and store it in sugars and wood (cellulose), potentially long term. If we planted enough trees, even if we then harvested these trees for timber, we could dramatically reduce or even stop the increase in carbon dioxide in the atmosphere. This would slow or stop ocean acidification, in addition to making moot the debate about global warming. How can plant more trees? Isn't most land with enough moisture to grow trees already growing crops for food? This was the case, there way little more arable land, until the invention of the Groasis Waterboxx. The Groasis Waterboxx was invented to plant trees and other plants in very dry areas without irrigation. The Groasis Waterboxx collects dew and rain water using its lotus leaf inspired lid. This water is stored in a reservoir, and slowly released through a wick to the roots of a growing plant. This allows the plant (usually a tree), to develop deep roots that reach underground capillary water. When the tree reaches this water, it is drought resistant and the Waterboxx can be removed and reused. Dew Harvest® LLC was founded because we saw the value of the Waterboxx, and were upset that it was not more widely used in the United States. We began selling the Waterboxx, and you can buy the Waterboxx at our website. We truly believe that trees are the solution to many of the world's ills, including increasing carbon in the atmosphere and ocean acidification. Be the first in your area to start growing trees with the Waterboxx.